Worms is a strategy game developed by UK-based company, Team17. It was the company's first release across multiple formats, having been released for practically every prevalent platform at the time. 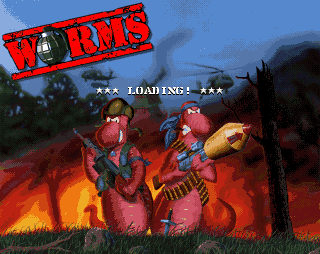 In 1996 an expansion called Worms Reinforcements was released for the PC MS-DOS version of the game, and they were later released together on one CD as Worms and Reinforcements: United, also referred to simple as Worms United. On October 19th, 2011, the MS-DOS CD-ROM version of Worms was released on Steam. In January 2012 the game was made available on GoG.com. Both versions are based on Worms United (though only the GoG.com release is listed as such) and include an emulator to allow the game to run on modern Windows-based PCs.